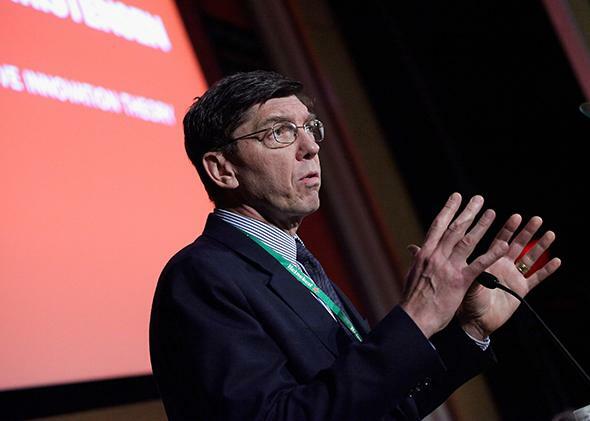 Clayton Christensen and disruptive innovation: Is the concept a myth? A cut-rate summary of Jill Lepore’s long, expensive, high-quality magazine story about Clayton Christensen. Stock image of Clayton Christensen, grabbed hastily before hitting publish. On the cover of this week’s The New Yorker, an 89-year-old print magazine widely considered among the finest in the industry, is a provocative story by Jill Lepore that takes aim at “the gospel of innovation.” In it, Lepore dissects Clayton Christensen’s theory of “disruptive innovation” and finds a number of flaws that cast doubt on its descriptive and predictive powers. You could pay $6.99 in the United States or $7.99 abroad to buy the magazine and then devote half an hour to reading her story. Or you could read a quick summary here, for free, with a little snarky commentary thrown in as a bonus. No doubt my online opinion column about Lepore’s story will be inferior to the original work in many ways. After all, I’m writing this in the space of a few hours, whereas she presumably devoted weeks or months to researching and developing her thesis. The New Yorker paid teams of fact-checkers and high-ranking editors to peruse her prose, layout editors to arrange it on the page, cartoonists to illustrate it, a printing press to print it, and the postal service to distribute it far and wide. We just loaded this into an online content management system, grabbed a stock image of Christensen, and hit “publish,” at virtually no marginal cost to Slate. At this point you may be feeling a twinge of guilt for choosing to read my article rather than her cover story, thereby rewarding Slate for its cut-rate approach. You might fear that you’re undermining the very business model on which the great journalism of The New Yorker has been built. You might even be tempted to view this troubling dynamic through the lens of disruptive innovation, which seeks to explain how established businesses can be blindsided by lean and hungry startups producing inferior products at a fraction of the cost for what initially appears to be a less-profitable market. Not to worry—as you’ll see from my summary, Lepore’s main point is that disruptive innovation isn’t all it’s cracked up to be. At least, that seemed to be her point up until the point where she started talking about journalism. Anyway, here’s what I took from her piece. People with something to sell used to pitch everything new as “progress,” but that notion lost some of its shine in the 20th century, what with all the world wars, nuclear bombs, and genocides. Today they speak of “innovation,” a term that was once pejorative—meaning newness for newness’ sake—but is now exalted. 2. The book that coined the term “disruptive innovation” relies on some shaky anecdotal evidence. The most substantive and compelling part of Lepore’s article is her critical rereading of Clayton Christensen, the Harvard Business School professor who wrote The Innovator’s Dilemma and developed the theory of disruptive innovation. In each case, Lepore complicates Christensen’s account with facts that don’t fit his tidy narrative. For instance, Seagate—the disk-drive firm that Christensen held up as the archetypal victim of the innovator’s dilemma—remains a leader in the sector, while many of the insurgents failed. As for steel, Lepore thinks labor problems had more to do with U.S. Steel’s struggles than did mini-mills. And besides, U.S. Steel remains the largest domestic steel producer. 3. The theory of disruptive innovation has no predictive value. 4. The arenas Christensen and others are now trying to disrupt ought not to be disrupted. Innovation and disruption are ideas that originated in the arena of business but which have since been applied to arenas whose values and goals are remote from the values and goals of business. People aren’t disk drives. Public schools, colleges and universities, churches, museums, and many hospitals, all of which have been subjected to disruptive innovation, have revenues and expenses and infrastructures, but they aren’t industries in the same way that manufacturers of hard-disk drives or truck engines or drygoods are industries. Journalism isn’t an industry in that sense, either. The difference, she explains, is that doctors, teachers, and journalists have obligations to their patients, students, and readers—whereas industries simply “turn things into commodities and sell them for gain.” She uses this distinction to imply that the New York Times is wrong to re-evaluate its editorial approach in response to disruptive innovations like the Internet, blogs, and social media. Either that or the disruptors aren’t playing fair when they target a nonindustry like journalism. 5. The “upstarts who work at startups” have large coffee machines and also no morals. To show that these uppity youngsters are vicious as well as feckless, Lepore recruits venture capitalist Josh Linkner, who fills in admirably as a straw man whenever she can’t find Christensen making the particular outrageous claim she wants to debunk next. Startup types, she says, are taught by investors like Linkner to “forget rules, obligations, your conscience, loyalty, a sense of the commonweal.” She’s paraphrasing here, but again, the point is that disruptive innovators are not only mythical—they’re also dangerous and must be stopped. 6. All of this has something to do with Steppenwolf and the decline of religion. Whew! I guess Christensen isn’t the only one who overreaches now and then. 7. Disruptive innovation is simply a theory about why businesses fail. “It’s not more than that,” Lepore says. “It doesn’t explain change. It’s not a law of nature.” As for the future, it’s “unreadable.” This is the piece’s big payoff, and it’s hard to argue with, as far as it goes. The funny thing is I already agreed with it going in. Stray ramblings about God and journalism aside, Lepore’s piece largely succeeds in skewering the zaniest of the “disruptive innovation” zealots and highlighting the fallibility of their prophet and holy text. And her revisionist reading of Christensen’s book adds some important caveats to his model. Importantly, the “disruptors” don’t always win in the end, and in some cases established businesses might harm themselves more by overreacting than underreacting. It would also be a great service if Lepore’s story had the effect of making people stop and think before they throw around “disrupt” as a buzzword. That said, Lepore’s cherry-picked counterexamples don’t definitively overthrow Christensen’s theory any more than his own cherry-picked examples definitively prove it. Overused and reified as the phrase “disruptive innovation” has become, it remains useful as a descriptive model for understanding how incumbent businesses can sometimes struggle to fend off smaller startups peddling seemingly lower-quality products. If it really has no predictive power, though, I suppose Lepore is in luck: The Times—and by extension, her own employer—need pay no heed to Christensen’s warnings.